Schiwago-Melodie [German] [2:56] Same as on the Zauber einer großen Stimme LP. Lebe Dein Leben [3:23] Also available on the Musikalische Edelsteine & From The World CDs. Wenn Ich Einmal Reich Wär [German] [4:55] Also available on the Simply The Best, Musikalische Edelsteine, The Very Best of Ivan Rebroff Volume II & Russische Seele CDs. Same as on the Reich Mir Die Hand LP? Wolgalied [German] [3:50] Same as on the Zauber einer großen Stimme LP. 'S Ist Mal Bei Mir So Sitte [2:34] Also available on the Musikalische Edelsteine CD. Same version as on the Na Zdrovye LP. La Montanara [3:04] Also available on the From The World CD. Same as on the Zauber einer großen Stimme LP. Abendglocken [Russian] [3:44] Also available on the Simply The Best CD. 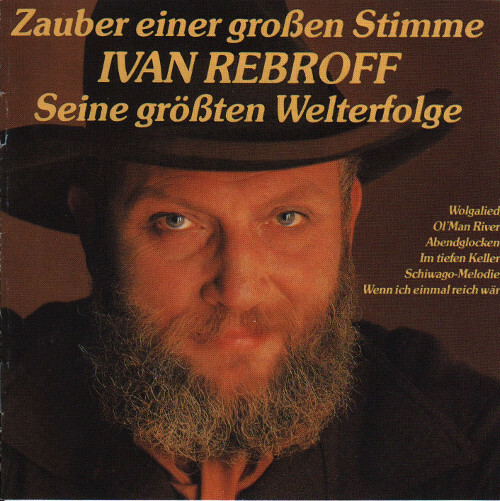 Same as on the Russische Weihnacht mit Ivan Rebroff LP. Mein Russland Du Bist Schön [German] [3:38] Also available on the Simply The Best CD. Same as on the Mein Russland Du Bist Schön LP. Havah Nagila [2:54] Also available on the From The World & The Very Best of Ivan Rebroff CD. Same as on the Zauber einer großen Stimme LP. Ol' Man River [English] [4:06] Also available on the From The World, The Very Best of Ivan Rebroff & Ses Plus Grans Succes CDs. Same as on the Zauber einer großen Stimme LP. Das Einsame Glöckchen [Russian] [4:08] Same as on the Zauber einer großen Stimme LP. Kalinka Malinka [Russian] [4:00] Also available on the Kalinka, Ses Plus Grands Succes, Simply The Best & The Very Best of Ivan Rebroff CDs. Im Tiefen Keller [German] [3:54] Also available on the The Very Best of Ivan Rebroff CD. Sonny Boy [English] [3:09] Also available on the From The World CD. Same as on the Zauber einer großen Stimme LP. Zwei Weisse Wolken [German] [3:17] Also available on the Come with me to Hellas & The Very Best of Ivan Rebroff CDs.